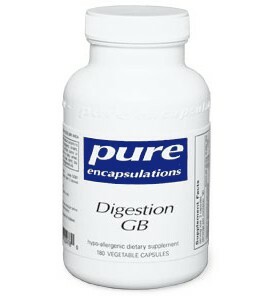 *Digestion GB contains digestive enzymes, bile salts, taurine and herbal extracts to promote healthy gall bladder function and fat utilization. The metabolism of fats involves emulsification and digestion in a complex process that requires healthy liver, gallbladder and pancreas function. Milk thistle, curcumin and taurine promote liver and gallbladder health and stimulate production and secretion of bile acids. Bile acids, also provided in the form of ox bile salts, support the emulsification of fats necessary for digestion. 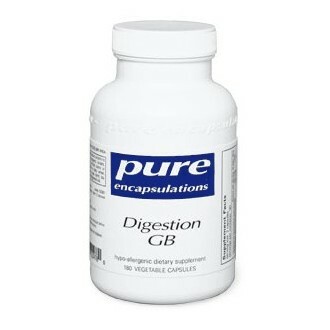 The digestive enzymes included in this formula are active in a broad pH range to support fat, carbohydrate and protein digestion to complement pancreatic enzyme activity. This formula has enhanced lipase for extra fat digestion support.